MakerBot Print allows you to View, Arrange, Orient, Scale, and Preview a sliced version of your 3D model. You can also use and work with multiple build plates to view and edit multiple 3D models. This is a comprehensive guide for MakerBot Print, if you would like a quick start up guide for MakerBot Print, please click here. Every 3D print starts with a 3D model. If you want to print a 3D model you designed yourself, export it from your 3D modeling application in a compatible format. You can also download 3D models on Thingiverse.com. To open an object to your local computer, open the Project Panel, click Add Models, and navigate to the location of the saved file. Select the file and click Open to import it into MakerBot Print. You can also click File>Insert File to import the object into MakerBot Print. Once a model has been added, it is available to be used on your build plate. File - Allows you to create new projects, open and save, projects, insert and import files, and access system preferences. If you have a multi-file STL assembly, select File > Insert STLs as Assembly. Edit - Allows you to undo an action, redo an action, as well as, copy and paste objects. View - Allows you to view your model from an array of 2D views, 3D views, and multiple perspectives. Help - Enables Help with MakerBot Print and allows you to check for updates. 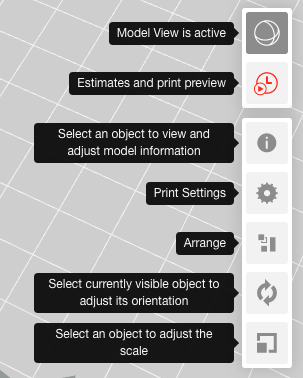 ● Click the Project Panel to import models into MakerBot Print. ● You can also create multiple build plates to manage large build projects. Under Build Plates, click the + button to insert another build plate. ● To delete a build plate, right-click the build plate preview and select Delete Build Plate. Models that were on the deleted build plate become hidden, but they are not deleted. Prepare and arrange your 3D models on the build plate. Click and hold the right mouse button and move the mouse to be able to view your model from any angle. Press and hold the Shift key and the right mouse button together to move the build plate in space. Zoom using a track pad or the scroll wheel on your mouse. Slices the 3D model into layers so that you can view the path the Smart Extruder+ tool will make while printing the model. Play Animation shows all the layers that make up the sliced model and animates them. Play Animation shows you how your 3D model will be printed, and is a good tool to use to confirm that your file does not have errors. Layer Range allows you to view sliced the model up to a certain layer. You can slice the model and view all layers, up to a certain layer, a single layer, a single layer with one layer above and a single layer with one layer below. Display allows you to turn on or off certain information regarding the slice preview. Select the Model Material checkbox to turn on or off viewing the rendering of your 3D model. Select the Support Material checkbox to view the support structures that may be part of your 3D model. Select the Travel Moves checkbox to view the travel moves from a project. Travel moves are parts of the extruder path where the Replicator+ extruder moves without extruding any plastic. Select the Layer Highlight checkbox to highlight the selected layer. Allows you to change the units that your 3D model is measured in. You can cycle between mm, cm, m, in, and ft. Please note that the software will assume your model was designed in millimeters. If you are using a MakerBot Method, please refer to the "Print Settings - Method" section of this article. Select Extruder Type to choose which type of extruder you are using. Select the Supports checkbox to have your model print with support structures. 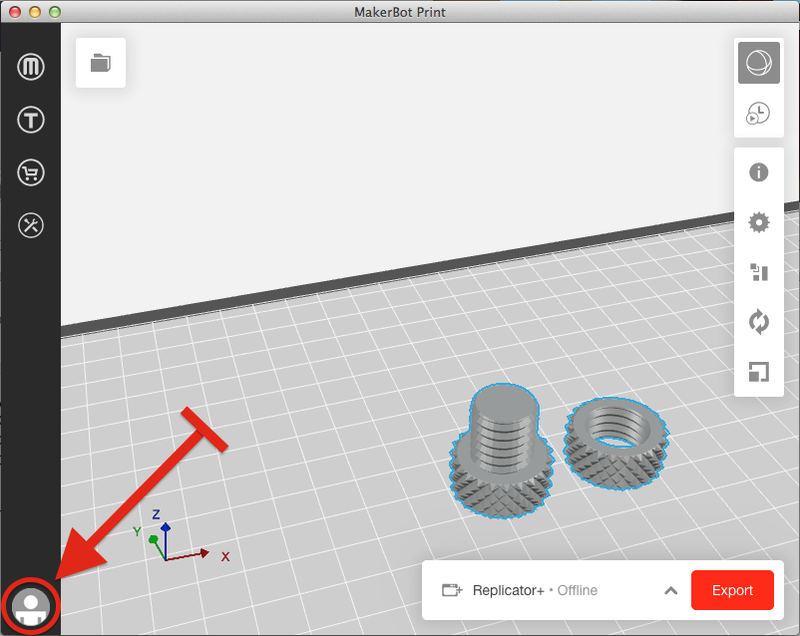 MakerBot Print will automatically generate supports for any overhanging sections of your object. Supports will be easily removable once you remove your finished object from the build plate. For information on custom settings, click here. For Method prints, there is no need to select extruders types like our previous generations of printers. When connected to a Method, the printer will detect the material inside the material bays and select the material automatically and set the proper settings based on your print mode. If you are exporting a .makerbot file from an offline environment, you will need to select Tough or PLA prior to exporting for your print. If there are multiple objects on the build plate, select the Arrange Build Plate to move the objects to the most optimal placement on the build plate. If there are multiple objects on the build plate and all of the objects can’t fit on the original build plate, select Arrange project to arrange the objects to the most optimal placement on the build plate. Objects that can’t be arranged on the original build plate will be moved to another build plate and arranged optimally as well. Use the right-click menu to copy, paste, hide, or delete your model from the build plate. Select Place Face on Build Plates to lay your model flat on the build plate. Rotate your model by 90 degrees or by a specific number of degrees along the x-, y-, or z-axis. Select Uniform Scaling to adjust the scale of your model equally along the x-, y-, or z-axis. Enter the percentage of how much you want your model scaled. De-select Uniform Scaling to scale the model by a specific amount along the x-, y-, or z-axis. Select the 3D printer to be used with your project. Select the printer drop-down and Add a Printer > Add a Network Printer on your local network or Add an Unconnected Printer for exporting files. Once finished editing your 3D model, select Export to export your model into a sliced file or Print to print your file if it MakerBot Print is connected to a printer. Login to MakerBot account. You can also switch to a different MakerBot account.